The Farming Simulator franchise is a treasure, and should be treated as such. The franchise has been trucking along for almost a decade, and considering it’s a yearly instalment, the franchise manages to be consistently entertaining. 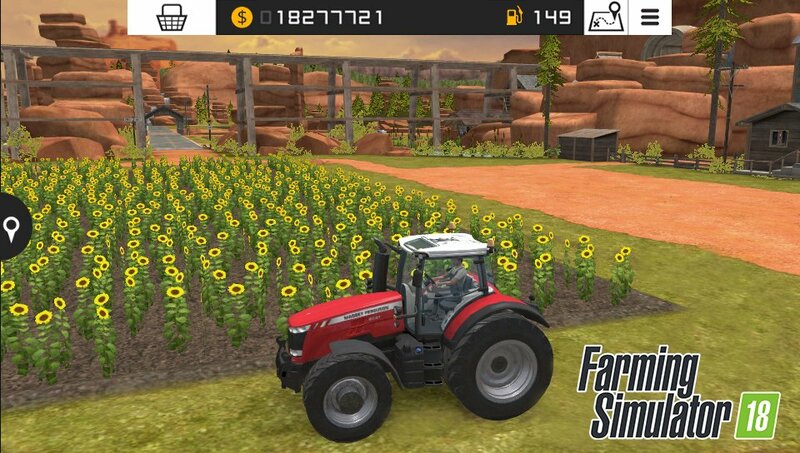 Now, nine years after the first entry launched, we have Farming Simulator 18 on the PlayStation Vita and 3DS, and comparing it to its console counterpart released last year, it improves on the formula by streamlining most of the tasks. 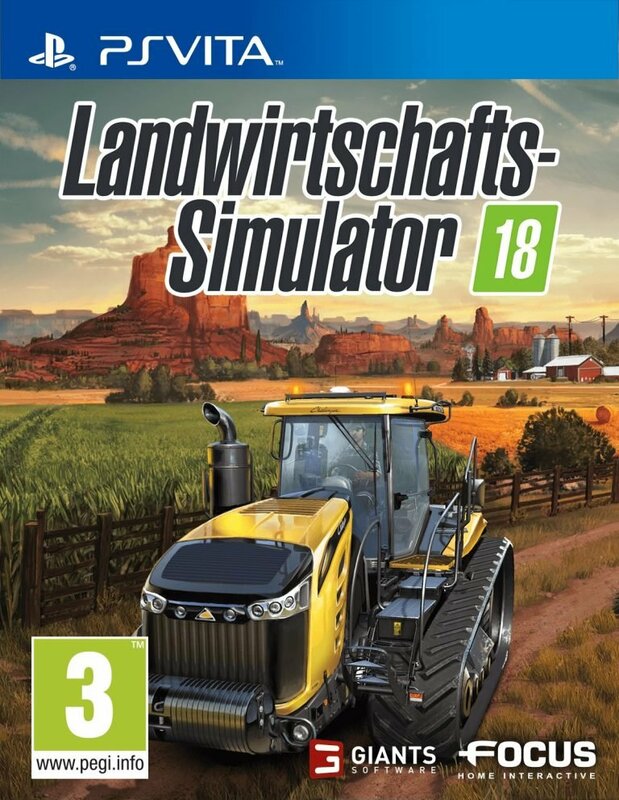 The basic premise of Farming Simulator 18 is simple. Much like other games in the series, players are given a plot of land and a few vehicles to help sew seeds, till the crops, get involved in forestry, and whatever else farmers do. Aside from crops, players can breed and transport livestock as well. This includes cows and goats, but new to the series are pigs. So there is something kind of new for returning players. The process is rather complex, as players use legitimate farm equipment made by real manufacturers for any task. Once the crops are harvested, players drive the haul into the city and collect their cheque. That money, in turn, goes towards upgrading items, and generally expanding the farm, as well as filling up the gas tank. The only issue is that there are points where the game doesn’t tell users what to do next. While it’s rather straight forward, I found myself going through some trial and error to get the result I needed. While prospective farmers tend to their crops and animals, they will receive random tasks to complete. They pop up whenever, and they’re completely optional, but they are actually are an ingenious way to break up the mundane that comes with any farming game. But that’s the beauty of the game is how simple and relaxing it can be. Farming Simulator is a bit of a grind, no doubt, but its soothing and calming in a way very few titles tend to be. Since this entry happens to be a handheld title, tasks are dispersed in such a way that players have enough time to hop in and get work done in a short commute. While all this happens, players are treated to a relaxing soundtrack. It’s mostly a looped track of minimalist acoustic guitar, but it does the job. 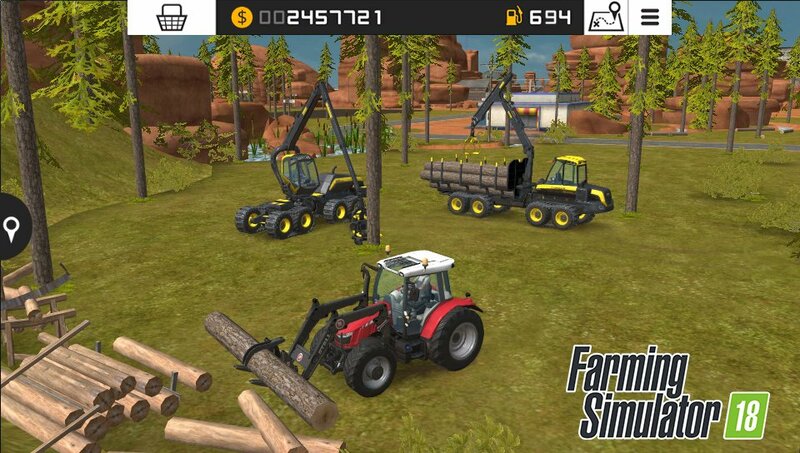 Video game music is supposed to blend into the background and compliment the gameplay, and in that sense, Farming Simulator 18’s score adds to the feeling of Zen that comes with tilling the fields. It’s also worth noting the actual sound design, as a whole is rather impressive for a handheld title. While the trucks and machines don’t sound exactly on the mark, they are varied. The jump back to handhelds means the experience is a little more bare-bones compared to Farming Simulator 17 though. To start, players can’t leave their vehicles, meaning the more free-flowing feeling of last year’s console instalment is replaced with a more streamlined approach. This is welcomed, however, as this is such a big game, that tends to be confusing to newcomers, so the ability to just switch between vehicles instead makes the game a little easier. Along with that, there is only one map to choose from. Instead of the multiple European inspired landscapes, players are dropped into a singular American town. There is a mix of rock and actual grass, making for an interesting mix of almost desert and oasis, so at least the visuals were interesting. Overall, the omission of multiple maps doesn’t change much of the game, it’s mostly an aesthetic thing, but it was an interesting takeaway, and considering this is a handheld instalment, it can be excused. Still, even with some of those cuts, players still have over 50 vehicles to choose from made by over 30 legitimate manufacturers, so there is a lot of content for the hard-core farmer out there. While I was worried jumping into a handheld Farming Simulator from a control standpoint, I was shocked with how tight the vehicles handled. Last year, I managed to completely flip over my pickup truck by making a simple turn. In Farming Simulator 18 however, tractors don’t move too quickly, and they’re able to make tight turns without a ragdoll feeling. Overall, Farming Simulator 18 is at home on handhelds. It seems like this style of game lends itself better to this style of gameplay, and it makes sense considering similar titles like Harvest Moon did the same. By cutting certain features, this title can feel a little bare bone, but in a way, these subtractions made for a game that feels better and less overwhelming. 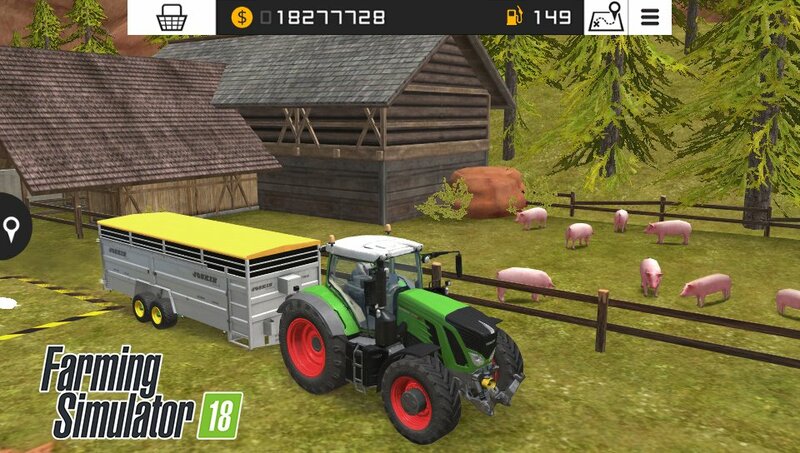 So, in a way, Farming Simulator 18 actually improves on its console predecessors by cutting the fat. 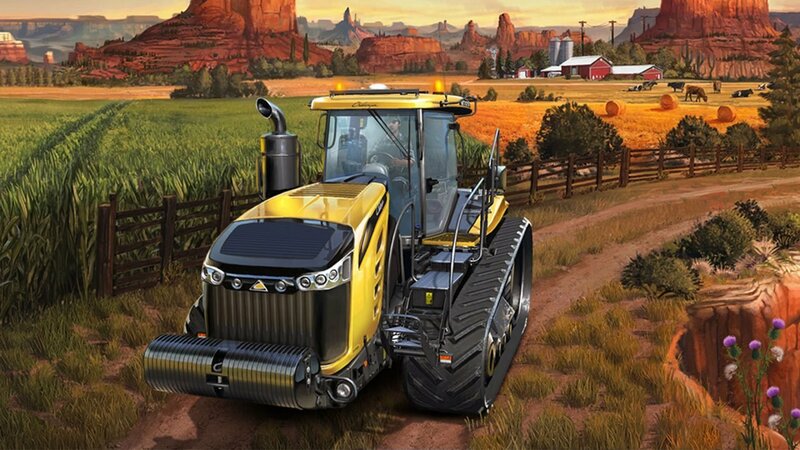 Farming Simulator 18 actually improves on its console predecessors by cutting the fat.